Around the Bay Area we call San Francisco the city. Something I learned in a hurry when I first moved here. Now I say it like I've been here forever. LOL There's something cool about settling into a place and throwing the slang around like it's always been yours. Last week I went to the city for the Yoga Journal Conference. 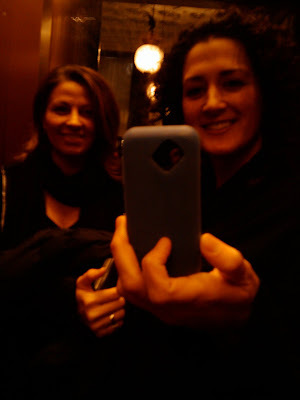 My friend Jen was volunteering at the event so I stayed the night with her one night in the most beautiful hotel! 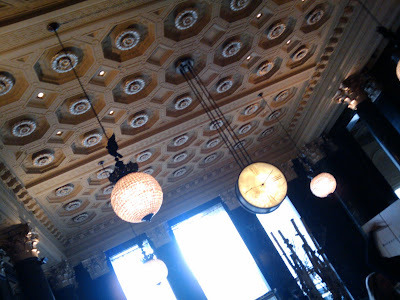 The Westin St. Francis is old and so beautiful! It first opened in 1904 and you can just feel that it's air is thick with history and stories from days past. I love going to hotels. When we were kids Mema used to take us to hotels just so that we could be fancy. It was the best. I still feel like a trip to a hotel is a treat. p.s. A snickers bar in the mini bar was $8.50! You can always gage a hotel by the price of the mini bar snickers! LOL! The entry ceiling looks like something from the Titanic. There are huge grandfather clocks and beautiful chandeliers. I love this print from our room. It's so simple but stunning don't you think!? The hallways are extra wide and I could just picture ladies all dressed up in their big poofy dresses headed out for dinner. The chandelier in our room made the most beautiful patterns on the ceiling. On my way home out the car window with my camera. 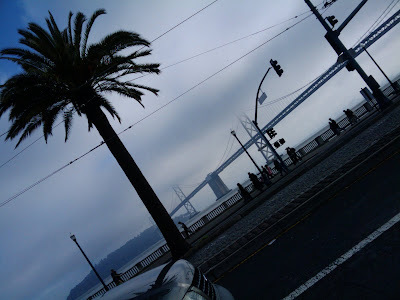 It was foggy and dewy and the bridge looked so pretty past this proud palm. I love that I live where palm trees grow.